HRNK Briefs are a series of reports collected by our interns and staff from relevant panels, conferences, and events to deliver timely and useful information to the North Korea community of interest. This is a monthly effort to update HRNK supporters on current events and policy considerations surrounding North Korea. Last month, we prepared reports on four different events in Washington, DC. 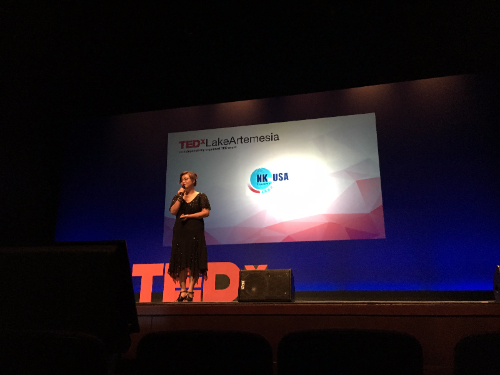 On August 6, 2017, at TEDxLakeArtemesia in the University of Maryland, North Korean American Jinhye Jo shared her daunting story to freedom in addition to raising awareness for human rights in North Korea and the plight of North Korean defectors. Per Jo's account, there are more than two hundred North Korean defectors in the US and thirty thousand in South Korea. She further disclosed that sending information into North Korea is critical. From left to right: Samantha Ravich, Tom Malinowsky, Jonathan Pollack, Anthony Ruggiero, and Josh Lederman. Photo Credits to FDD. On August 24, 2017, HRNK Executive Director Greg Scarlatoiu and Director of Programs Rosa Park attended the breakfast conversation "Addressing the North Korean Threat" hosted by the Foundation of Defense and Democracies. 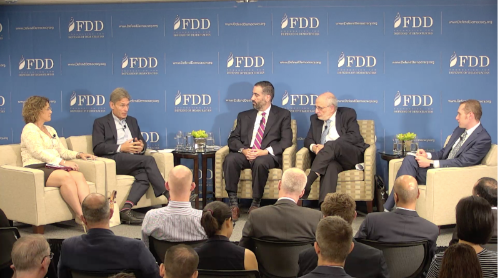 With rising tensions between Washington and Pyongyang, experts discussed a range of issues from strategically handling the regime's proliferation, to human rights violations in North Korea, to China's role on imposing sanctions, to the increasing cyber threat posed by the regime. 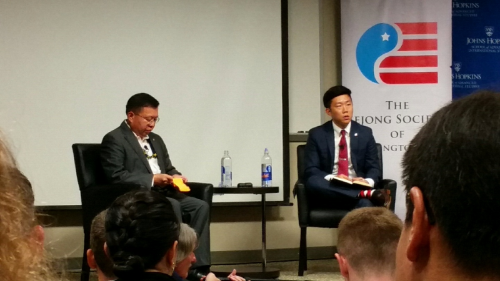 On August 3, 2017, Lieutenant General In-Bum Chun gave a lecture titled "Korea Defense Reform 2.0," hosted by the US-Korea Institute at Johns Hopkins SAIS and the Sejong Society in Washington, DC. Chun reviewed the ROK's evolving military strategy across administrations before voicing key policy recommendations concerning the current political situation. Amongst his many insights, Chun proposed diversified solutions based on the Art of War by Sun Tzu to deal with North Korea. 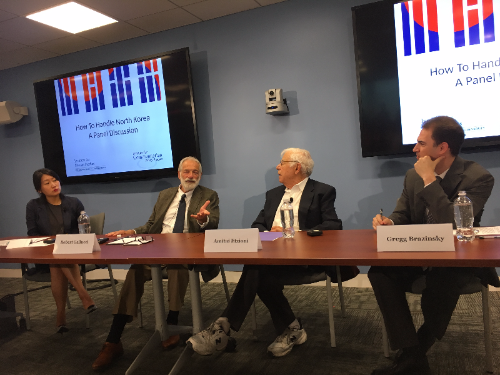 On August 28, 2017, Robert Gallucci, the former Dean of the School of Foreign Service at Georgetown University and Chief US negotiator during the North Korean nuclear crisis of 1994, along with professors Amitai Etzioni and Gregg Brazinsky from George Washington University, spoke on the panel titled, "How to Handle North Korea." The presenters, hosted by the Institute for Korean Studies, discussed options against a nuclear aggressive North Korea. ​Please note that the views and opinions expressed by the speakers do not necessarily represent the views or official position of HRNK or its Board of Directors. While not verbatim transcriptions, every effort has been made to accurately depict the speakers' presentations and views. Any error or omission is unintentional and will be corrected upon notification and request. These notes are based on events open to a public audience. The Committee for Human Rights in North Korea (HRNK), founded in 2001 and based in Washington, DC, is a non-partisan human rights organization whose principal objective is to raise international awareness of North Korea's human rights situation through the publication of well documented reports and by undertaking outreach activities in support of the recommendations in those reports. More information about HRNK is available at www.hrnk.org. ​Help HRNK spread the word! HRNK, a 501(c)(3) nonprofit, relies on donations to support our programs and to provide website content and services free of charge without commercial advertising. Your support enables HRNK to continue our important work promoting human rights in North Korea.